This year we got to enjoy a 4-day long weekend thanks to Hari Raya. Seeing that everyone was likely going to spend this long weekend to somewhere nice, I too wanted to do likewise. However, flight tickets during this peak season were crazy expensive so my husband and I settled for a road trip to a place that the kids and I had never been before, Kuantan. At first, I hesitated going to Kuantan because it would at least take us about 4 hours in the car to get there. I was mostly worried about how the kids would handle the long car trip, especially Brennan. After much contemplation, we gave this plan a green light as we didn't want to be stuck at home during this precious long weekend. You have no idea the kids' stuff that we packed into our car before we hit the road. It was as if we were traveling half the globe while in fact, we were just going to be out of town for 3D2N. Before we commenced our road trip, Naomi saw her Dad putting the swimming inflatable floats and her beach sand toys into the car so she knew for sure she would be going for a swim. As such, she literally repeated "I want swimming." "Naomi wants swimming" "Papa, I want swimming. ""Where is the swimming pool, ah?" every 15 minutes for the whole 4.5-hours' trip. Picture the scene when Donkey, Fiona and Shrek are OTW to the Kingdom of Far, Far Away in Shrek II and Donkey relentlessly asks "Are we there yet?" until Shrek and Fiona got fed up. My husband and I experienced this scene in real life when we were on our way to Kuantan. Lemang and Chicken Rendang for our lunch in the car. Other than putting up with the winding roads and Naomi's incessant questions about swimming despite our promise, explanation and answers, I think the road trip to Kuantan went relatively smooth and fuss free. Brennan didn't even poop in the car which was a good thing. The kids were so overjoyed and relieved when we finally reached the hotel, after being stuck in the car for nearly 5 hours. Finally! Big bed to jump and roll around! Here are the places that we checked out in Kuantan. Unfortunately we didn't manage to cross off all the places-to-visit-in-Kuantan items in our list because some of the tourist attraction spots closed for few days during Hari Raya holiday. After we checked in to our hotel, it was already about 4pm. We didn't really have a plan of places to go at that hour because it's also near dinner time. The receptionist at our hotel recommended Teluk Cempedak, a famous beach which is situated not so far away from our hotel in the city center. We're glad we followed her advice. Perfect evening weather in Teluk Cempedak. Mirror, mirror on the wall, who was the happiest of all to see the beach? No prize for guessing. And excuse my tired face. Teluk Cempedak is quite a beautiful and clean beach with golden sands. It's definitely worth visiting if you go to Kuantan. The evening weather was perfect for beach time when we went to Teluk Cempedak. It was neither hot nor rainy. Wore her full swimming gears. Someone immediately ran to the beach to get wet and the other one decided to take power nap first. 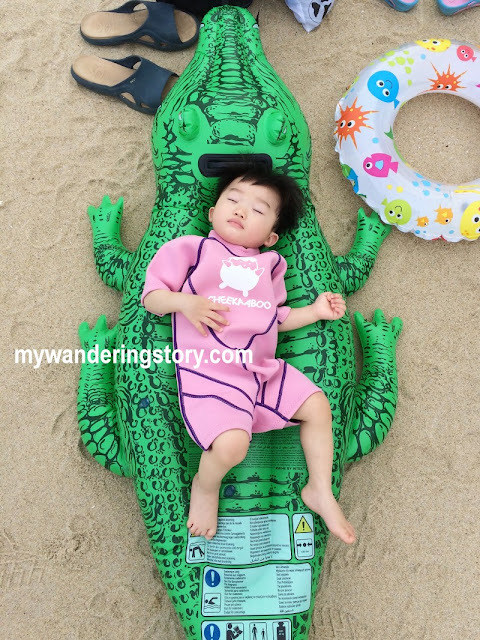 Baby on croc attracted people's attention. I noticed Teluk Cempedak has rather powerful waves so I refrained B from playing in the water for safety reasons especially since he's so tiny. covering his feet and the sound of the waves. My husband also felt the same when I expressed my concern about the strong waves in this bay. He commented that the strong crashing waves could even make a child like Naomi fall down when she stood in the shallow water hence he was always standing next to Naomi when she was having a good time playing in the water. Also, an uncle who was taking a dip in the water advised my husband to be careful when swimming in this beach because of the small jellyfish that may accidentally sting us. Beautiful scenery aside, other things that I like about Teluk Cempedak is that the area surrounding the beach is very well maintained and has a good infrastructure too. The public toilets, albeit not fantastically clean, are located not so far away from the beach so it's very convenient for visitors to clean up or take a shower after spending time at the beach. Visitors would have to pay about RM 0.50, I guess, to use the washrooms for shower. After going back to the hotel to bathe Brennan then went to East Coast Mall, one of the newest shopping center in the heart of Kuantan, for dinner. On our second day in Kuantan, my husband drove us to Sungai Lembing, a tin mining town in Kuantan that once was dubbed as El Dorado of the Eastknown aka the richest town in Pahang. It's a famous tourist spot and about 45 minutes' drive from Kuantan's city center. Actually our main agenda in Sungai Lembing was to have a look at the tin mine, El Dorado. We went there at the wrong timing though because the Museum and El Dorado Tin Mine in Sungai Lembing were closed during Hari Raya holiday and we only found out about it when we got there. What a bummer. In the middle of the bustling town. After my husband found a car park in the crowded little town (that is well packed with tourists from all over Malaysia! ), we had noodle lunch at a busy shop on the main street, few shops away from the 3D Gallery. Apparently, Sungai Lembing is well known for its homemade tofu, silken tofu and soya drinks that are produced using the local river water. Very nice Yong Tau Foo Noodle. We had very yummy lunch on our first visit to Sungai Lembing. I don't know the name of this shop but it's located in the bustling center of Sungai Lembing, opposite the Food Court. Below is the photo of the noodle/YTF shop. Since the main tourist attraction that we'd like to see in Sungai Lembing was not open, my husband brought us to check out the popular Kolong Pahat's Hanging Bridge. I was very surprised to see the amount of tourists, including bikers and those who arrived using the tour buses, checking out this bridge. The moment we were about to cross the bridge that connects both sides of the river, I loudly asked my husband if this bridge was strong enough to handle the large number of people standing and walking on it. So many folks crossing over this bridge. This bridge is relatively long and shaky. It's undeniably nerve-wrecking to cross this bridge especially since I was fully aware that there were A LOT of people trying to cross the bridge at the same time. To cross a scary hanging bridge like this, in my opinion, you need to walk fast to ease your fears of height or the shaky bridge. Sadly, I was not able to do this. All of us had to walk at snail pace because there were many people in front of us and next to us. Not to mention, there were some kids who purposely shook the rope rails of the already shaky bridge and fearless kids like Naomi who was jumping in the middle of the bridge... #wahlao Crossing this bridge reminded me of why I avoided joining scouts at all cost during my schooling days. No kidding. One long bridge, isn't it? What's going on at the other end of this bridge? Why is the bridge so famous you wonder? Possibly because of these two shops behind me? One sells roast pork and the other one sells handmade noodles, I guess? Not too sure about the latter. Actually not long after we knew that there's nothing much on the other side of the river, we walked back to the bridge and crossed it again to get back to our car. As we left Sungai Lembing to Kuantan city center, my husband recognized this tall limestone hill where Gua Charas (Charas Cave) is. Previously I did tell him I was not so keen in entering a boring dark cave with the kids, so we skipped visiting Gua Charas - a decision which I regretted later on. Gua Charas in the background. On our way back from Sungai Lembing, my husband suggested us to drop by one of the biggest temples in Kuantan. Beautiful Chinese garden at the back of the temple. I thought it was going to be another typical Buddhist temple like many other temples in Malaysia but I didn't expect this temple to have beautiful scenery with a huge lake. The garden attracts so many visitors too, even during a scorching hot day. Another worth visiting place in Kuantan. The kids had fun running around, touching and taking pictures with the comical monk statues around the garden. Doing what the monk does. And looking at the fish and tortoises in the lake too. Both kids were excited with the fish and tortoises. I didn't go to the inside of the temple so can't say much about or post pictures of the inside of the building. We had our late lunch at a Chicken Rice/Wantan Noodle restaurant which name or location I can't remember but we bumped a friend of mine from Seremban while having lunch there. One of the things that I really wanted to do in Kuantan was visiting Natural Batik Village - not so much for shopping batik fabric or shirts itself but more for doing a batik painting session with Naomi. Thank heavens, when my husband called them on our second day in Kuantan, the staff informed that they're open until 7pm (it was Sunday and Public Holiday too) so off we went to paint some batik! Happy girl was very happy with the painting activity. Upon reaching the premise, we immediately went straight to the painting areas to pick the fabric design (mostly with flowers or animal design) that we'd like to paint with the fabric dyes and brush. The big fabric is priced RM 10 each and the smaller one is RM 8 each. I got the big ones for Naomi and myself because it's only RM 2 different anyway and I reckon, it's easier to paint on the bigger clothes. I don't mind doing it again if I had extra time in Kuantan. I chose to paint the fabric with orchids design and Naomi wanted to paint the one with a smiling turtle in the middle. We spent about 2 hours there, slowly channeling our inner Van Gogh while the husband was babysitting Brennan who could not sit still. Not bad for first timers, eh? After we're done painting our batik, we're supposed to collect the final results the next day because the staff would need to rinse and clean the wax on the painted fabrics with special chemicals then dry them before passing them back to us. As we did not want to wait, go back again to this place on the next day nor have the final products delivered to our house (they charge RM 15 for the postage, if I heard correctly), we waited for the staff to simply blow dry our batik works of the day before leaving the place. Consequently, our painted batik fabrics' colors were kind of run off by the time we got back to Seremban, not as pretty as they were just freshly painted. However, come to think of it, we treated this this batik painting experience for novelty and fun, rather than to keep the final products as particular souvenir or have them framed, so it's okay. "Mommy, I finish with the big turtle. I want the small turtle." Naomi was ecstatic with this activity. She kept asking to paint another one, the turtle in the smaller fabric, but we didn't grant her wish because we still had more places to visit in Kuantan so could not afford to spend too long time in this batik shop/workshop. Naomi constantly mentioned "the small turtle" for the next two days, I tell you. She clearly really had a great and memorable time here. We planned to visit Cherating Beach after we were done with Natural Batik Village. However, as my husband was searching a beach that has toilets nearby, we ended up checking out a wrong beach. We only got to know that we hit the wrong beach after we finished playing at this beach. Who's the happiest every time we go to the beach? Pantai Batu Hitam offers a vast stretch of grayish sandy beach, not so strong waves, shallow water and has separate toilets for male and female nearby. This beach is so much quieter than Teluk Cempedak in terms of the numbers of visitors. Therefore, I think my husband and Naomi had so more fun playing here than they were in Teluk Cempedak. I also let Brennan play water in this beach for a while... not too long because I forgot to pack extra dry clothes for him and myself then little man so I didn't want the both of us to get wet. Brennan also pooped while he was busy playing with the beach sands and waves, so yeah... I had to rush him to the toilet to clean his bum and sand covered feet. Alas, Cherating Beach was not ticked from our list! Done having fun in this beach, we drove back to the hotel so Brennan and I could take a shower then we went to have dinner at a food court not faraway from our hotel. On our last day in Kuantan we attempted to go to El Dorado mine in Sungai Lembing again although we were doubtful if they're even open on the 3rd day of Hari Raya. My husband called their office but nobody picked up the phone. As I noticed their advertisement on their parked tour bus that says they open every day, we decided to try going there once again presuming that they're somehow busy hence not picking up the phone. Right after we checked out from our hotel and had our breakfast, we drove to Sungai Lembing again. Before we went to Sungai Lembing, my husband took us to see Sungai Pandan Waterfalls (sometimes referred as Panching Waterfalls), a popular picnic and recreation spot in Kuantan. To enter this place, we were charged RM 7 for the car park and adult entrance fees. I didn't know that this place is actually a popular recreational spot with some kids so engrossed taking a cool dip and splashing water in the waterfalls and some families were even picnic-ing on the sandy grounds beside the streams. To see this view below, we needed to walk across the jungle trails and cross a shaky bridge (again!) with wooden flooring that's missing two or three nails. The visitors of the waterfalls, when we were there, were not that many so it's generally less scary to cross over the shaky bridge as we knew it would not be too overloaded with people. in two days' time in my life. We even managed to take a quick family picture while standing in the middle of the bridge. Family picture with the beautiful waterfalls in the background. All in all, this place is worth visiting if we're in Kuantan because the cascading waterfalls are indeed scenic... Nonetheless, I definitely would not be interested picnic-ing, let alone, camping here. Operating hours: 9am-5pm (weekdays), 9am-6pm (Sunday, Public and School Holidays). Close every Friday. Moving on, we continued our journey to Sungai Lembing and pressed our luck with El Dorado for the last time. Well, well. We were not fated with El Dorado mine this time around because it's still closed when we went to Sungai Lembing for the second time in two consecutive days. After having lunch at the busy town of Sungai Lembing, we concluded our family trip to Kuantan and went back to Seremban. Another 4 hours' long road trip with two kiddos but we survived! Lastly, should we go to Kuantan again in the near future, four top places that we would very much like to visit there would be El Dorado Tin Mines, Gua Charas, Cherating Turtle Sanctuary and Kuala Gandah Elephant Sanctuary.